All eyes will fall on Milan this May for the opening of the 2015 World Expo. 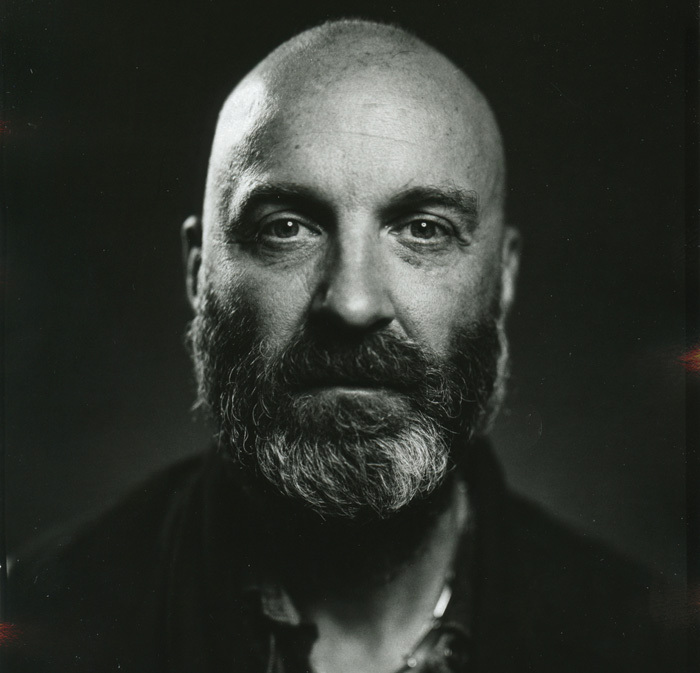 Here, we highlight just some of the pavilions to look forward to, while Herbert Wright meets the British pavilion’s designer, Wolfgang Buttress. The heavy task of uniting myriad international voices at the Universal Exposition falls on Milan this year. Ever since the first edition in 1851 at London's Crystal Palace the Universal Exposition has been the ideal stage to show off some of our most ambitious creations and technological advancements, including the telephone in 1878 to the Eiffel Tower of the 1889 Expo, and Mies van der Rohe's iconic Barcelona pavilion of 1928-29. Initially, exhibits tended to forecast a better future for society, fostering an intercultural exchange of innovation; later they became a platform for individual countries to promote their own image. At Expo 2000 in Hanover, countries started to flex their creative muscles, designing their own pavilions. Now in its 64th edition, and with 144 countries involved (there were 192 at Shanghai's Expo 2010), the global event is as ambitious as ever, despite being conceived during an economic downturn. This year the theme is Feeding the Planet, Energy for Life, which will encompass food production, food culture and our relationship with land. It is a topic that reflects the huge challenge of balancing our greedy consumption with the depleting natural resources of the planet. Covering an area of one million square metres, the massive exhibition site in the northwest of Milan is expected to welcome some 20 million visitors in its six-month existence from May. This will be the second time Milan has hosted the Expo, the first being the Milan International of 1906, held in Sempione Park in the city centre. 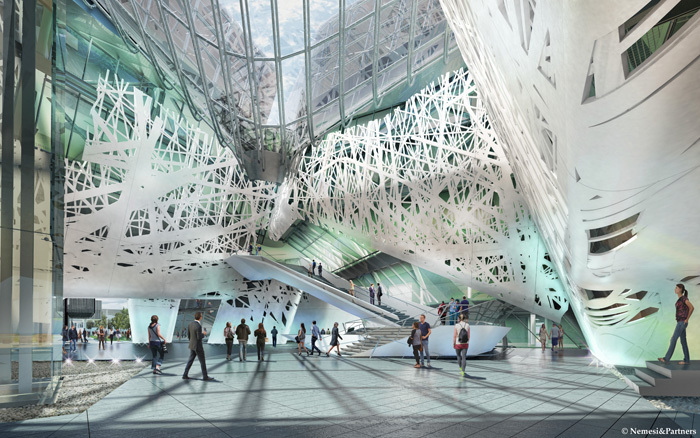 Designed by an international team of architects, including Stefano Boeri, Ricky Burdett and Jacques Herzog, the site sits adjacent to the new Fiera Milano fairground by Massimiliano Fuksas. It is organised around two perpendicular streets, the Cardo and the Decumano, inspired by a typical Roman camp or castrum. On either side of the 1.5km-long Decumano are the national pavilions, half of which are temporary, while a large lake surrounded by seating is at the northern-most point of the site. Symbolically, the Decumano connected the place where the food was consumed (the city) with the place where the food was produced (the countryside). There will also be an open-air theatre dedicated to outdoor events, a hilltop overlooking the pavilions and a new permanent Italian pavilion designed by Nemesi & Partners. Clusters are one of the new attractions of 2015: for the first time the pavilions are grouped not by geographical area but by a common theme and food group (for example rice, cocoa and spices, or arid zones and islands). Sustainability is also a big factor this year. One of the main, and certainly most ambitious, features of Expo 2015 is a 125km-long green and blue-coloured route around the site made up of water and cycle routes. It's part of a bigger project called Waterways that aims to add value to the open spaces west of Milan. The route is based on the waterways that already characterise Milan and the Lombardy region and will help improvements to the irrigation system in the area around the city, together with the cleaning up of one of its main canals, the Darsena. National pavilions have their own green credentials too, from 'smog-eating panels' on Italy's, and modular parts that can be dismantled and reused elsewhere from the Czechs, to France's walls of growing hops and whole fields of wheat courtesy of China. 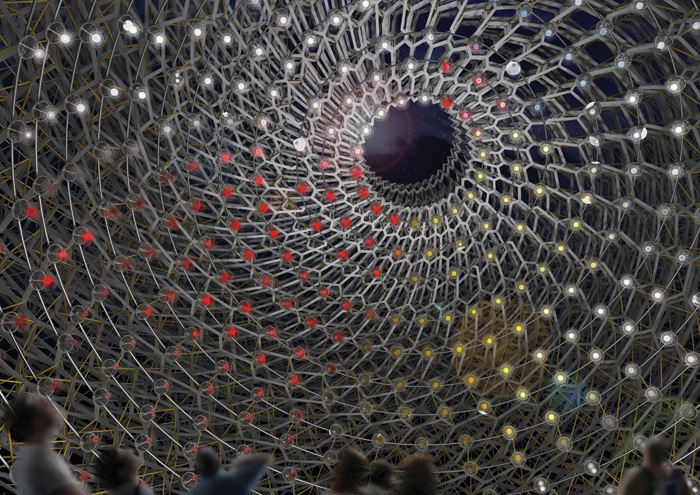 There is also Wolfgang Buttress' design for Britain, developed around the concept of a beehive and featuring a 40m-long meadow. Over the next few pages we highlight just a few of the many pavilions going on show in May. 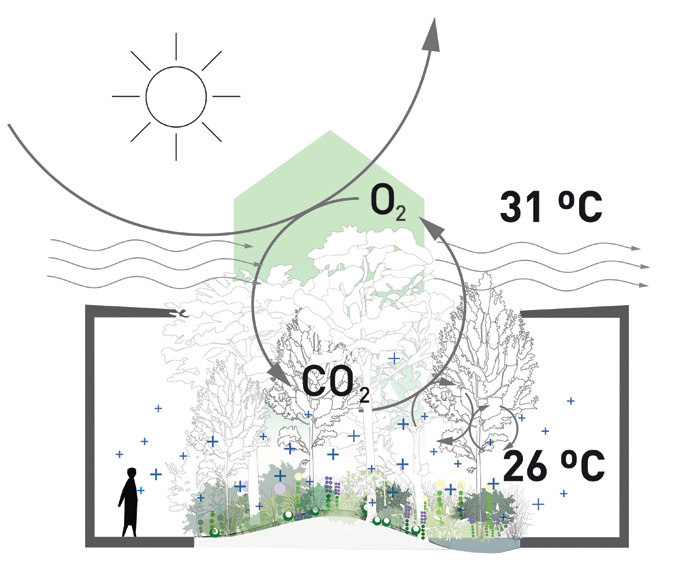 Austria's €12m pavilion, conceived by a multidisciplinary team of representatives from the Technical University of Graz and the Vienna University of Natural Resources and Applied Life Sciences, aims to highlight the country's ecological and technical capabilities by focusing on the key element of air. Taking inspiration from the country's natural resources, from lakes fresh enough to drink from to its bucolic Alpine regions, their research focuses on ecological, energy-related and social change in the environment. Visitors to the 560 sq m space will be immersed in a dense thicket of Austrian plants, trees and foliage, which will run through a regular yearly cycle for the duration of the six-month Expo. 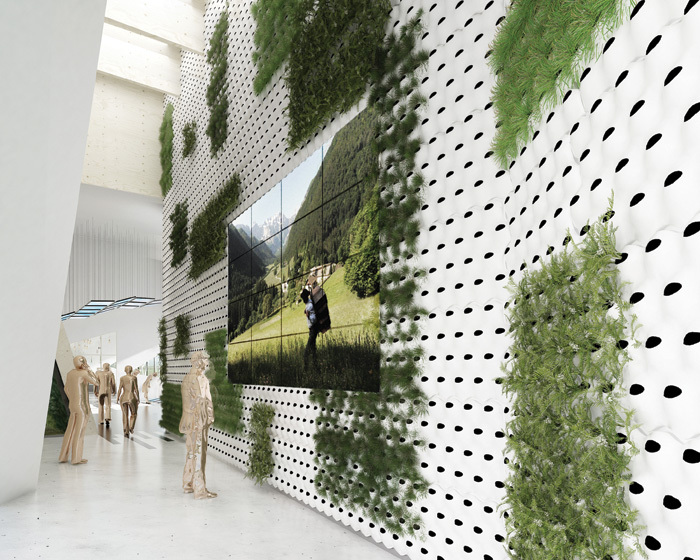 'In line with the Expo's motto "Energy for Life", we will create a pavilion for breathing, with an atmosphere that feels like a thick forest in Austria. One breath of our Austrian forest will stay in your lungs for two years!' enthuses its designer Klaus K Loenhart. 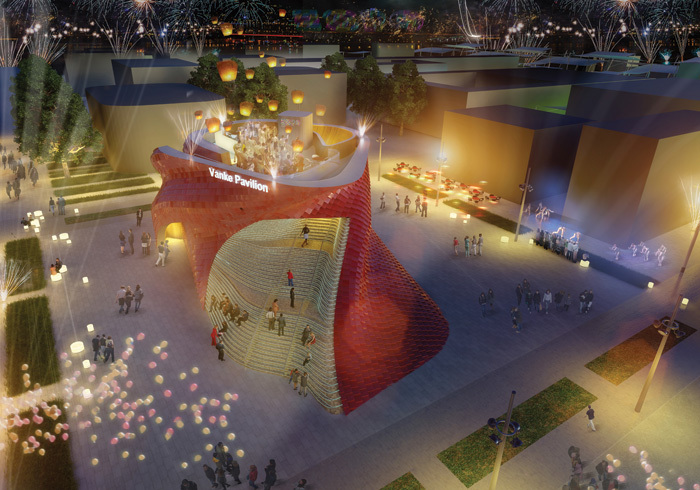 Envisaged as a cloud-like structure hovering above the ground, China's pavilion will be experienced as a sequence of exhibition spaces beneath a floating roof. The wooden frame of the building references the 'raised-beam' system found in traditional Chinese architecture, but also uses modern technology to create its long spans. Beneath the wavy roof, the ground floor features an indoor field of wheat to reference China's agrarian past. This natural landscape will transition into an installation using LEDs that forms the centrepiece of the building's exhibition programme. Here there will be interactive installations and cultural offerings from different Chinese provinces. Its aim is to recall the tenet of Chinese philosophy that 'man is part of nature,' and to illustrate its cultural traditions and progress in the areas of agriculture. It is also the first time that China has participated in an Expo with a self-built pavilion. 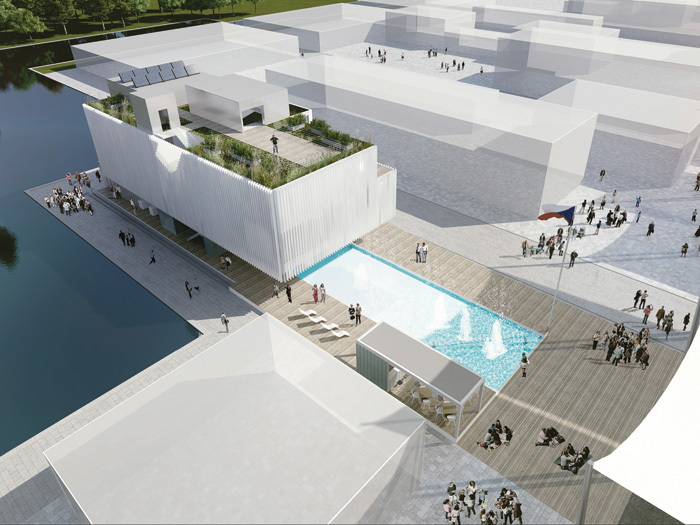 The concept for the Czech pavilion is based on the element of water. Designed by young architects Ondrej Chybik and Michal Kristof, it presents the latest progresses in nanotechnology for water purification as well as the Czech Republic's history with water, for example with its spas. The pavilion caters for the fatigued visitor, with three restaurants, an open 350 sq m green roof and a swimming pool. Visitors will be given branded flip-flops, bathing suit and towel in the hope that they will promote the pavilion elsewhere. The structure itself is made up of modular parts that can be dismantled after the Expo and taken back to the Czech Republic for reuse. The designers have even suggested that the bottom part may continue life as a restaurant with a swimming pool on the Prague waterfront. 'How can we feed the world today and tomorrow?' This is the question the France is putting forward for its pavilion, designed by the Paris-based studio X-TU. The pavilion is divided into four areas, based on ideas around global food production, new food models, improving self-sufficiency in developing countries, and aligning quantity with quality. The lightweight building, made mainly of laminated wood, is inspired by the covered markets of France, themselves a symbol of French food culture and a central element of many cities across the country. Hops and aromatic herbs will grow on its latticed structure, while a restaurant and shop will sell French food. 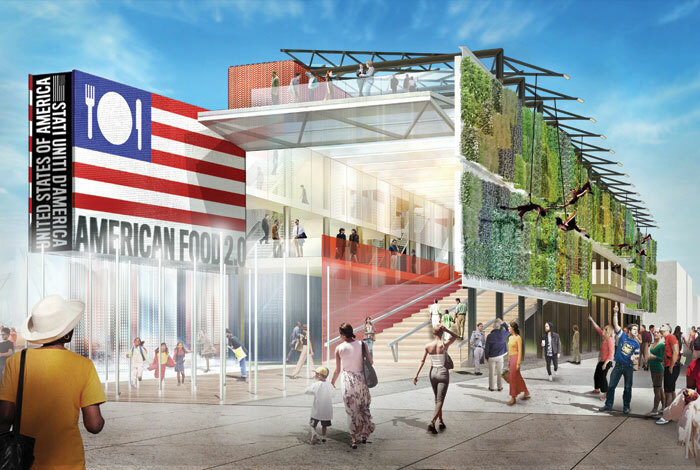 The Future Food District, which presents possible scenarios for the application of new technologies at each step in the food chain, is one of five thematic areas of the Expo that respond to the central theme Feeding the Planet, Energy for Life. 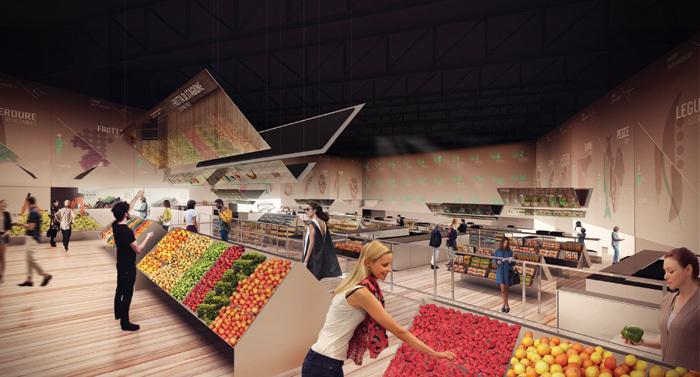 The design, headed by Carlo Ratti, director of the SENSEable City Lab at MIT, comprises a 2,500 sq m pavilion with an interactive supermarket experience, as well as a 4,500 sq m public square. Ratti describes it as a 'micro universe' in which the visitor is invited to explore a more ethical and transparent food chain. The pavilion itself will be highly interactive, with huge screens suspended over tables providing information about the groceries on display. They will show details of the product's provenance and characteristics: just by touching a product, perhaps an orange or a banana, visitors will receive an augmented label of its origins and history. Elsewhere in the kitchen, it will be possible to experiment with smart technologies with the help of professional chefs. Outside in the square, hydroponic cultures, microalgae canopies and vertical vegetable gardens will show new possibilities for urban agriculture and energy production. There will be reconfigurable kiosks for the preparation and selling of food, while it will be possible to eat on large 'green' tables: round spaces cultivated with herbs and spices. To top it all off, a vertical plotter will inscribe the information that visitors are sharing, in real time, on the facades of the pavilion. Located on the Cardo, one of the two perpendicular axes of the Expo site, Italy's pavilion takes its inspiration from an 'urban forest'. Its facade, otherwise hiding a simple glass box, is marked by an intricate spider's web-like lattice. Inside, an internal piazza represents the starting point of the exhibition as well as the symbolic heart of the complex. Above it hangs a giant, conical skylight. 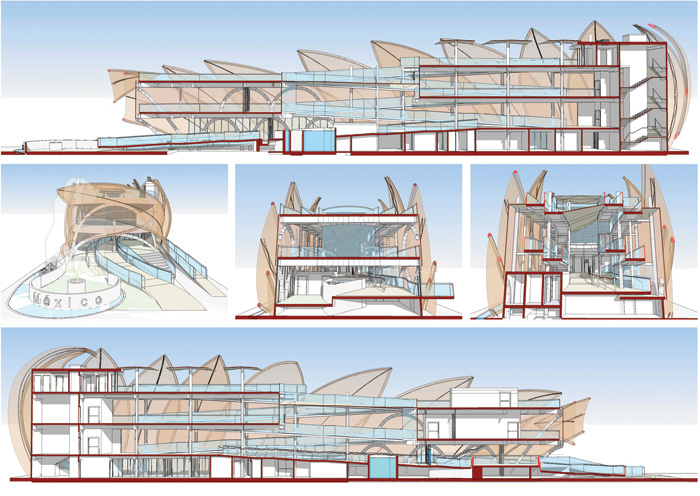 The rest of the building is divided up into four volumes housing exhibition spaces, an auditorium, offices, and conference and meeting rooms, with a panoramic terrace on the top. The design of the building places an important emphasis on sustainability, with a photovoltaic glass roof, likened by the architects to a 'forest canopy', and 9,000 sq m of photocatalytic concrete panels on the outer envelope. When the panels come into contact with light, they can 'capture' pollution in the air, transforming it into inert salts and reducing smog levels. The only permanent pavilion, the building will remain on the site after the Expo as a centre of technological innovation. 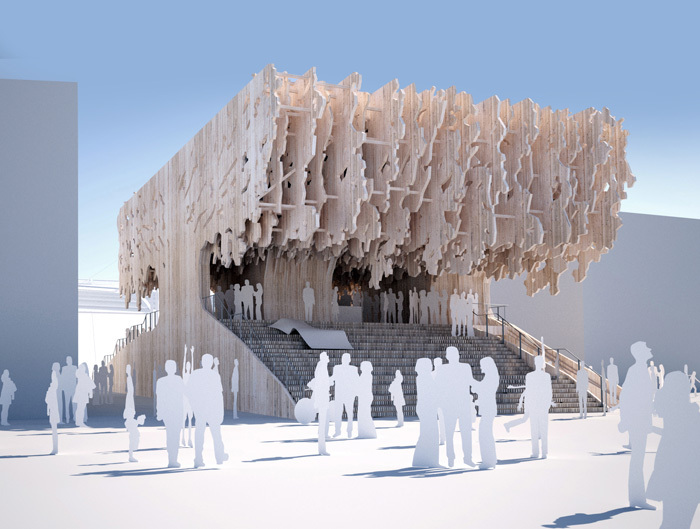 Latvia's pavilion takes the form of a large oak tree, under which visitors can congregate and shelter during the Expo. The exhibition will focus on the senses, using everything from Latvian music to the aroma of bread freshly baked on site. The 550 sq m open-plan base of the structure will be made up of steps and slopes, to form a natural amphitheatre for concerts and other events. There will also be an information desk and kiosk serving slow food, while the kitchen and services will be hidden away in the 'trunks' and 'roots' of the tree. Above this, concealed in the 'foliage' of the oak tree, there will be a conference centre and office space. There's bound to be a big buzz about the British Pavilion at Milan Expo 2015, the brainchild of artist Wolfgang Buttress. It's all about bees, a surprisingly suitable subject to tie in with the Expo's official theme of Feeding the Planet, Energy for Life. 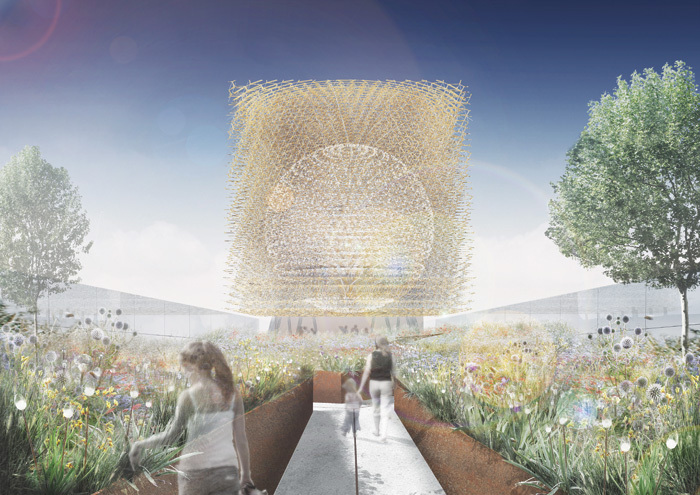 According to the British Beekeepers Association, upto a third of our food depends on bees as pollinators, and in Milan bee-energy monitored in a real UK hive will drive a multimedia experience in the pavilion's centrepiece, a virtual hive. There's an urgency here as well, reminding us of the fact that bee populations are plummeting, along with our food security. Buttress, whose large, stop-and-think sculptures now grace four continents, admits that 'I'd never seen a beehive' before 'complete serendipity' brought research work by Dr Martin Bencsik at Nottingham Trent University to his attention. Bees communicate through movement in the hive, and Bencsik uses accelerometers to measure the vibrations that causes. He has identified the message that bees give shortly before they exit en masse to swarm, the stage when they are most vulnerable. Data submitted by Bencsik's accelerometers will translate into sound and light within a 9-metre spherical void, embedded with LEDs. This is set within a 14m cuboid lattice -- made of 30,000 nodes and 40 tonnes of aluminium -- of hexagons that form Fibonnaci spirals. The Hive is an extraordinary, dynamic sculptural structure, but it is only one element of the £6m British Pavilion, which occupies a rectangular plot of 20m x 100m. At one end, 70m from the Hive and framed by gabion walls, a small orchard of British fruit trees prefaces the reception, across which is displayed a real time video feed of actual UK bees. Beyond this, like Alice entering the garden of roses, one steps into a 40m-long meadow planted with native British floral species, which should attract pollinators. It is irrigated by grey water from a canal, and bedded behind Corten steel banks at waist height beside the path that cuts through it. Buttress says the first 'idea was to be immersive: take the British landscape. Second, raise the height: be at the same height as the bee. A very simple metaphor'. Before you, the dynamic Hive looms. The path becomes a mini-hexagonal maze that references the dance of bees, then leads through an amphitheatre into an open piazza. Above this, the Hive is buzzing and pulsing with light through a clear ceiling. Stairs beyond the Hive lead up to the 300 sq m terrace on the building at the end of the plot. The ground floor below has an auditorium and event space. The terrace has trees, seating and a cafe, and a bridge back into the Hive. Cross it, and the experience of the Hive will be as close to the real thing as possible. The meadow will be planted by April, a month before the Expo opens, while Hive construction is underway at Stage One, fabricator of recent Serpentine Pavilions and Heatherwick's Olympic Cauldron. Buttress drops by there once a week. 'I like being hands-on,' he says, adding that at his seven-strong Nottingham studio, 'I don't tell people to do anything that I can't do myself.' As for the virtual hive, Buttress says that 'it harks back to Paxton expositions', referencing the Crystal Palace of the first World Expo in 1851. 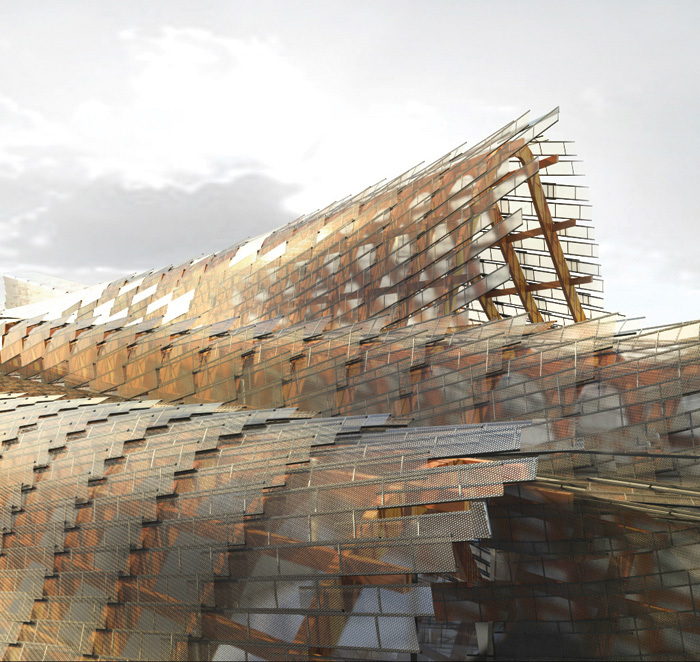 Inevitably, comparisons will be made between the Hive and Shanghai Expo 2010's world-wowing Seed Cathedral. 'It's one of the great things about this country that we look out of the box', says Buttress. There is the ghost of a box in the forms of both Heatherwick's splash of rods and the Buttress Hive, and both dissolve into the air above their Expo skylines. But the Hive's revelation of the spherical void, its lattice texture and not least the almost alien sound and light, make it very different. As for competition in Milan, Buttress has deliberately not looked much at other national pavilion designs, but he admits that 'the Chinese one looks madly impressive'. The British Pavilion has a six-month stint at the Expo, then hopefully a legacy afterlife in the UK. Buttress says: 'It's got to look amazing. This isn't the Chelsea Flower Show.' Indeed, with its fusion of nature and technology and focus on a vital insect in crisis, this pavilion has a real sting. 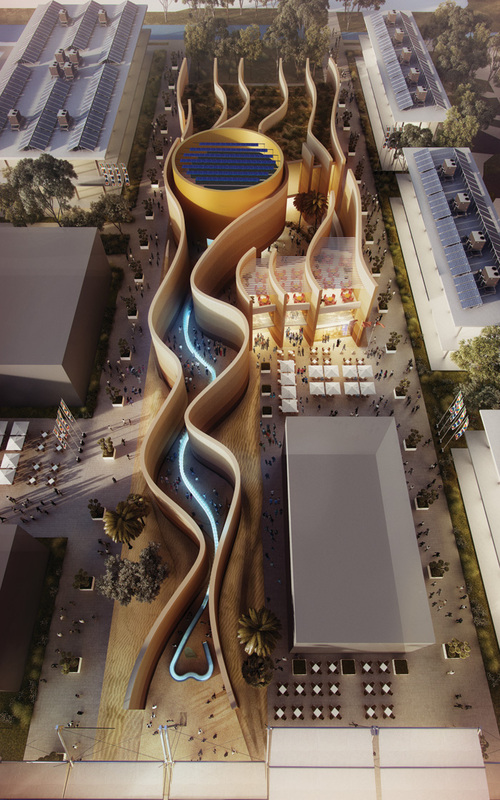 The design of the Mexican pavilion pays homage to corn, a cereal with the highest production volume in the world as well as being a staple of Mexican cuisine. The 1,910 sq m pavilion is inspired by dried corn husks, while inside, a system of ramps and platforms takes its shape from the old farming terraces that descended slowly down the mountains, irrigating and covering vast tracts of land. Also inside will be a central waterfall and botanical garden, exploring the gastronomic and ecological riches of Mexico. On the roof of the pavilion a vegetable garden will grow produce that forms part of the typical Mexican diet, including chilli, amaranth, chia and squashes. 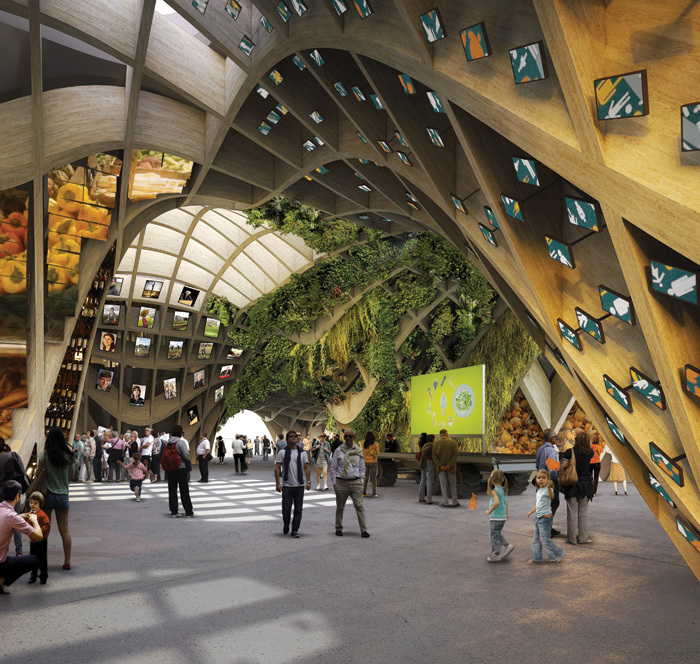 Slovenia's pavilion reflects on its own variety of flora and fauna -- from its vast forests to the abundance of its nature reserves -- to show the connection between a healthy environment and healthy food. Although in geographical terms, Slovenia is relatively small, the country has 24 self-proclaimed gastronomic regions, all of which can be sampled during the Expo. The building, which covers an area of 1,910 sq m, is inspired by the undulations of a cultivated field and features five angular fins. The Swiss pavilion reflects on the distribution of food resources in the world and invites visitors to reconsider their behaviour as consumers. Designed by Netwerch GmbH Brugg, the building is made up of four towers, full of local food products to which visitors can help themselves (water, salt, coffee and dried apple rings). But there is a limit to the resources available, as the towers gradually empty, the platforms underneath will lower, allowing everyone to see for themselves their consumption. Arriving from the Decumano, one of the two axes of the Expo site, visitors will enter via a ramp leading to a raised terrace that houses an exhibition of food types and nutrition in Switzerland. From here they can access the towers, a stage for concerts and a restaurant and shop. Once the Expo is over, the towers will be recycled in cities around Switzerland as urban greenhouses. The hope is that 75 per cent of the materials and infrastructure can be reused. Foster + Partners' pavilion for the UAE takes its elongated, sinuous form from the compact, self-shaded streets and courtyards of traditional desert cities. Visitors are drawn into the pavilion via two undulating 12m-high walls, which continue through the 140m-long site as a series of parellel waves, evoking the ridges of sand dunes. The walls themselves are supported by a steel frame that can be dismounted and reconstructed at the pavilion's final resting spot in the UAE. Along the route, visitors to the pavilion will come across augmented-reality devices and digital talks that will bring the story of the Emirates to life as well as an exhibition celebrating Dubai as host city for the 2020 Expo. America's pavilion, designed by New York-based Biber Architects, is being described as an 'open, airy, barn inspired structure'. Its aim is to showcase the country's role in the future of food around the world. 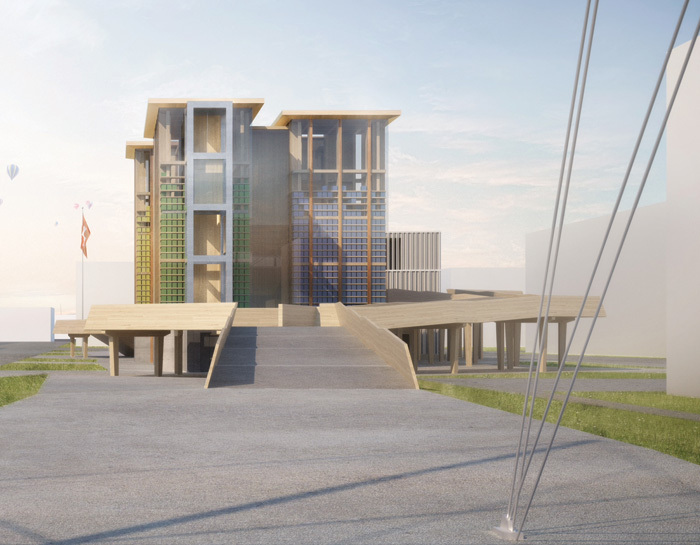 The aluminium facade of red, white and blue pays tribute to the American flag, while regional food trucks will feature in the space. The highlight of the pavilion will be a harvestable vertical farm -- the length of an American football field -- flanking one side of the structure. On the edge of the Lake Arena, Daniel Libeskind's pavilion for Chinese real estate giant Vanke reimagines a traditional Chinese Shitang or dining hall. The 1,000 sq m pavilion aims to tell the story of civilisation, technology and the 21st century as well as offering a space for reflection inside its twisting structure. It is also the first time in the Expo's 163-year history that a private Chinese company has had a pavilion of its own. Visitors enter via a grand staircase clad in white mosaic tiles to a 'constellation' of more than 300 multimedia screens mounted on a matrix of bamboo arms. Short films will show the importance of Shitang in the everyday lives of ordinary Chinese citizens, while a rooftop observation deck will provide views across the lake and the rest of the Expo.